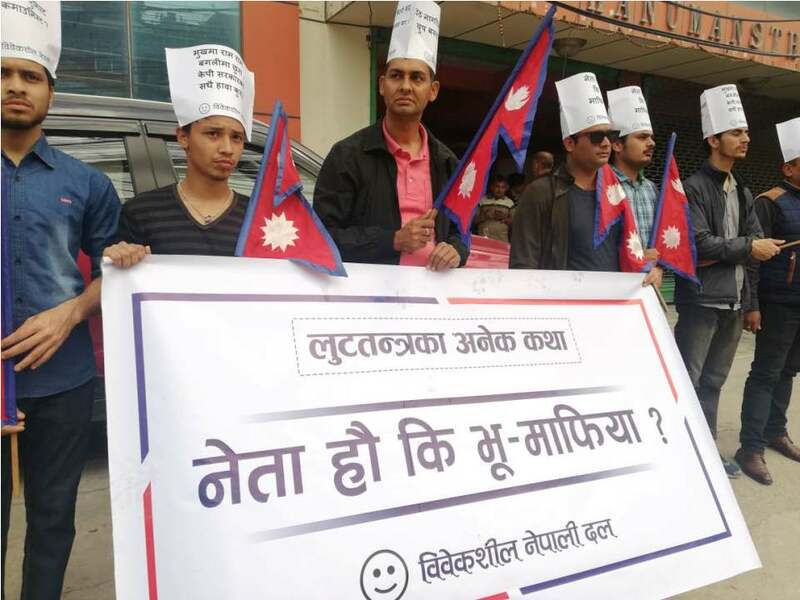 KATHMANDU, April 16: The Bibeksheel Sajha Party (BSP) and Bibeksheel Nepali Party (BNP) staged separate demonstrations against the various cases of public land grab carried out in connivance with politicians. At the demonstrations, scores of leaders and cadres of the two parties chanted slogans and displayed placards in front of the prime minister’s official residence at Baluwatar and near the Prime Minister’s Office, Singha Durbar. 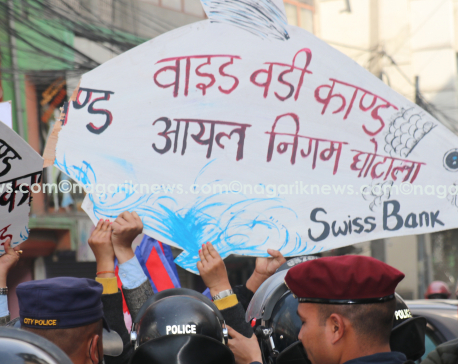 During the demonstration held by the BSP in front of the prime minister’s residence, leaders and cadres of the party urged the government to book the ‘big fish’ involved in corruption cases related to various land scams that have been recently uncovered including the Lalita Niwas land grab and Hotel Hyatt Regency’s ownership transfer. Similarly, the BNP demonstrated near Singha Durbar with the party leaders including convener Ujjwal Thapa questioning the involvement of political leaders from the ruling Nepal Communist Party (NCP) in several land ownership scams. In the BSP protest, leaders and cadres of the party displayed placards reading “Beware!! Those who sold out Baluwatar may also sell Singha Durbar,” “Singha Durbar is swarming with land mafia” among others. The government said last week that it has frozen the land transactions associated with Lalita Niwas at Baluwatar on the ground that the transactions were done in blatant disregard of the law. The Ministry of Land Management, Cooperative and Poverty Alleviation recently froze the transactions of the Lalita Niwas land after concluding that a group of erstwhile owners, land revenue officials and the 'land mafia' had managed to grab the 114 ropani land illegally. A preliminary study conducted by the government showed irregularities were committed while transferring the ownership of the land. The frozen property includes land ‘owned by’ Bhatbhateni Super Market and the land being used by the NRN Association for building its headquarters. It has already come to light that both Bhatbhateni and the NRN Association procured the controversial land from the family of then Prime Minister Subarna Shumsher Rana and the land mafia. The Rana family had already relinquished the land to the government after receiving due compensation. According to a probe panel headed by former Secretary Sharada Prasad Trital, of the total Lalita Niwas land acquired by the government from the Rana family during the Panchayat era, 113 ropani 3 ana ended up back in their hands and they sold the land to others. The remaining 12 ropani seven ana two paisa was distributed during the Panchayat era and another 3 ropani 12 ana three paisa was donated to Pashupati Tikinchha Guthi.